Size: 528 sq. m. "5683 SQ FT"
One spectacular penthouse with the most amazing views is waiting for you! Taking the entire level, this expansive property has great space for entertaining large groups. Walk into your new condo and be welcomed in by awe inspiring ocean views with wall to wall and floor to ceiling windows. Open concept wraps around the kitchen area to give so much usable space. Smart design offers designated spaces for everything. Start with the built-in bar to welcome your guests with a fresh beverage. Just around the corner is the kitchen that has been totally upgraded. You will find a wine fridge with integrated cold beverage and ice. The kitchen is open and is nicely appointed with top of the line Wolf and Subzero appliances to create your master pieces. A TV to keep up with the game and 2 dishwashers for easy clean up. Walk through the passage with tons of cabinet space for every cooking need. Along the way you will find a service quarters with full bath. Step outside to the huge lagoon facing terrace. This side includes a lighted onyx bar and wall for ambience. Large granite table rounds off the space. This is a great evening spot to watch the lights come up over the hotel zone and downtown. The best benefit is that you are protected from the winds on a strong day. There is even more space to add a lounge area. Back inside, across from the kitchen and bar is the formal dining area and formal living area to relax with friends and family. Just off the dining is the first guest bedroom complete with full bath, walk in closet and great terrace lagoon and ocean views. Facing the dreamy ocean views is the expansive terrace with so much space. Originally equipped with a pool, that has been removed but piping is beneath the tile should you choose to add a pool or Jacuzzi. Inside you will find next the family TV area. Next is the generously sized master bedroom with space for lounge or office area, full bath with double sinks and walk in closet. Further down the hallway you with find the second and third guest bedrooms, each with full bath, closet and access to the terrace. This is an incredibly well appointed property is offered furnished with whole house music system, upgraded electric and lighting system, tankless water heater, triple water filtration system, 2 commercial grade air conditioner units, upgraded cat 5 Kommerling windows, 2 garage parking spaces and 2 garage storage units. 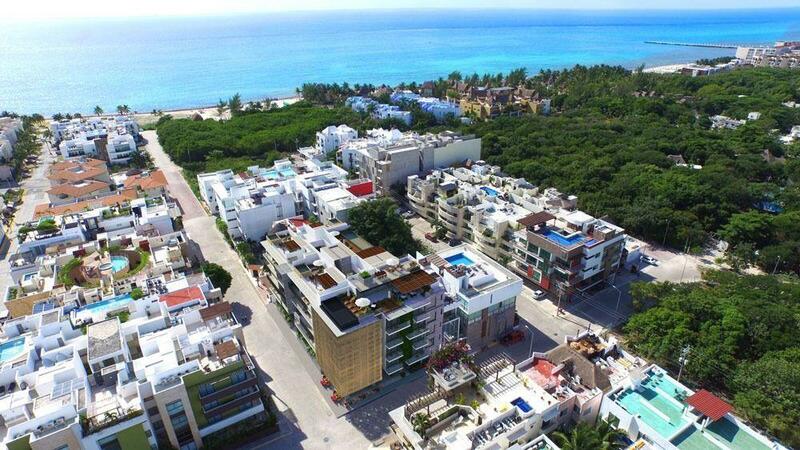 Onsite amenities include 24 hour security, pool and beach club, restaurant/bar, gym, spa and concierge. All this and the Mexican Caribbean lifestyle is waiting for your arrival!! Qualified buyers, contact me today for an appointment to view this exquisite property!